How can a business school adjust to the challenges of globalisation and digital? 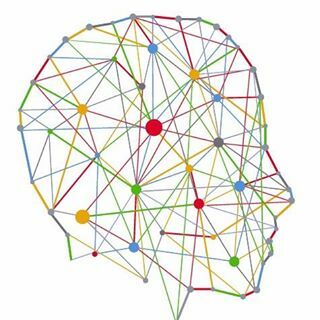 | The Forum Network, hosted by the OECD: Shape ideas. Shape policy. Shape the Future. Since the end of the Cold War, the rise of emerging economies and the consolidation of traditional actors triggered fast changes in every sector: economy, industry, science, technology and society. The simultaneous development of the internet and digital sustained international exchanges and increased the pace of change. However, the impact of globalisation and digital on the world very quickly showed its downsides: massive pollution, shrinking natural areas, social and economic disruption due to delocalisations and financial crises. With the mission to train tomorrow’s business leaders, how can business schools adapt to these challenges? In a world where 85% of jobs that will be proposed in 2030 do not yet exist today, and where the fourth industrial revolution is profoundly transforming companies and society, how can business schools promote responsible leadership? Globalisation and digital: threats or opportunities? Given the impact of globalisation and digital on environment and society over the past 50 years, the idea of progress no longer equates with well-being and happiness for all. It is time for institutions of higher education, and business schools in particular, to contribute to tomorrow’s world in training responsible leaders aware of the growing complexity of the challenges ahead, and of the necessity to improve global environmental sustainability and social cohesion. In a globalised economy, business schools must become “world-schools” with global impact, in order to give meaning to the leadership of tomorrow. It must be acknowledged that globalisation has contributed to alleviating extreme poverty in the world and to curb pandemics and famines that used to kill tens of millions of people just a century ago. Digital has contributed to reducing distances, improved communications, improved machines, tools, and taken charge of the hardest tasks that humans or animals used to have to do themselves. However, there is now a growing consensus and awareness that unlimited growth and benefits are no longer the answer to humankind’s needs and expectations. The bottom line is no longer the only criterion of success. To take into account these new trends and contribute to saving the planet, business schools must adjust their model. I shall use, as a paradigm of these adjustments, the evolution of ESSEC Business School, a French school created in 1907, of which I became the Dean and President in December 2017. The mission of business schools at the beginning of the 20th century was to train local industrialists and manufacturers to maximise production and benefits. However, since its beginnings, ESSEC has included ethics and values as a distinctive feature of its pedagogy and the basis of an alternative way of doing business: business with a human touch. From its beginnings in Paris, ESSEC has developed into a four-campus, worldwide business school with a presence in Europe, Asia-Pacific and Africa. ESSEC now sports an international network of academic and corporate partners, as well as an internationalised faculty (56%) and student body (34%). As an institution, ESSEC has pioneered social impact initiatives for over 15 years. In 2003, we started our Equal Opportunity programme and tutored 60 students under the “College: why couldn’t I?” initiative, a scheme replicated across France by the government in 2008. In 2018, our initiatives have helped more than 25,000 on-site students and a further 100,000 through online initiatives. Tutoring is a good example of a social impact initiative that is also a pedagogical experience for future business leaders: it is designed so students can help high school pupils from local underprivileged communities to get into the college of their dreams. ESSEC is a pioneer in social entrepreneurship with a dedicated Chair and Centres for Equal Opportunity and Excellence on Management and Society, all of which are devoted to study and promoting the positive impact of business on society. ESSEC is a part of the Council on Business & Society, along with Warwick Business School in the UK, the Sao Paulo Business School in Brasil, Keio University in Japan and Fudan University in China! Teaching at ESSEC has followed the trends of international management education, but with a consistent involvement in social issues. The awareness of the environmental and social impact of management decisions were seminal to a number of pedagogical innovations that are aimed at widening students’ and participants’ scope and stimulating their critical thinking. One of the highlights was the launch of the Edgar Morin Chair of Complexity. Other chairs were launched on specific social issues that can have an impact on companies, such as diversity and leadership, change management, and social entrepreneurship. Yet others include sustainability, including the real estate and sustainable development chair, or the consumer goods chair that launched a social responsibility competition open to retail companies operating in France. Optional classes and seminars on ethics are included in most programs with the exception of the finance track in the MSc in management, where it is compulsory. Responsible leaders are those who can see the broader picture. ESSEC is a school with French roots that aims to train the next generation of responsible leaders. Being a responsible leader means being able to see beyond business as usual. Responsible leaders are able to value long-term benefits over short-term profits; responsible are those leaders who are able to blend corporate performance and employees’ well-being. They understand that their impact goes beyond their own performance, and even beyond their company’s performance. The concept of responsible leadership is paramount to give meaning to the leadership of tomorrow. That is why a 100% online course on this very subject was developed, and is now a requirement for ESSEC’s Master in Management students. A result of collective and transdisciplinary work, the course revolves around four different aspects: relationships with clients and suppliers; relationships with employees and investors; responsibilities towards communities, civil society, state and the environment; and putting social impact at the centre of business. Combining free sessions, where students work at their own pace, and virtual, interactive classrooms with the Professor responsible for the course, students gain a deeper understanding of the challenges of responsible leadership. Read: Taking it from the Top: What makes an activist CEO? 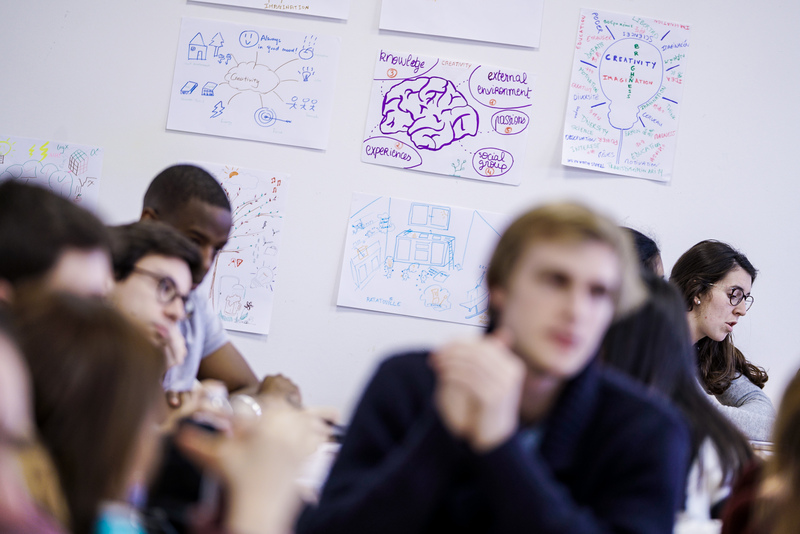 To prepare its students for the world of tomorrow, ESSEC seeks to awaken and develop creative and critical thinking using peer learning and design-thinking methods. At its core, ESSEC’s educational model is based on multiple learning experiences that foster the acquisition of cutting-edge knowledge and the development of hard and soft skills. We aim to empower students and give them the keys to imagine, create and lead in a business world that will be more complex and changing ever more rapidly. Read: OECD Forum 2018: Reskilling: How difficult is it? The school launched an innovative pedagogical experience, “iMagination Week”, which is now offered in every ESSEC programme, from undergraduate to postgraduate and executive level, on campuses, at home and abroad. The key aim is to develop students’ imagination and creativity. Over a week, prestigious speakers, scientists, philosophers, artists, dancers, mathematicians, pâtissiers and actors give conferences on a theme. In the afternoons, with the help of coaches, students must prepare their own interpretation of the theme and may choose their own medium (art, writing, music, digital, etc.). Many other experiences are offered, sometimes mandatory, with the sole aim of developing soft skills and creative competences not covered by economics or business classes. One of the best examples is the English short story writing competition that is mandatory for all undergraduates of the MSc in Management programme. Creativity is also encouraged in more business-centred courses, such as the Entrepreneurship or Creating an Innovative Product tracks, or the Digital Week Competition that brings real cases from companies or consulting firms. The main pedagogical tools here are design-thinking methods and peer learning. Hybridisation also influences pedagogy and program design, as ESSEC students can now develop hard skills normally associated with engineering education, such as data analytics or coding, that are at the core of new jobs now offered all over the world. Our management graduates have an advantage over engineers as their soft skills enable them to better communicate the value of their results to companies. Through our double degree and broader partnership with CentraleSupélec Engineering School, ESSEC promotes the development of hybrid Engineer/Manager profiles. Digital is above all a means to broaden the reach of education. For example, with MOOCS, schools can facilitate access to high-quality training all over the globe for promising professionals without degrees or students without internationally recognised diplomas. In order to reinforce this effort in continued education, ESSEC is investing in developing its 5th Campus: the Augmented Digital Campus. 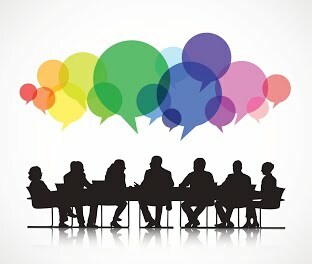 This is an online learning community that relies on new educational methods and experiences, such as collaborative learning through gamification techniques. With the Augmented Digital Campus, the idea is not to try to mimic on-campus teaching – to be only as good – but to invent a different way of teaching tailored for online communities. This is where the challenge lies. Beyond MOOCs, digital is a revolution as big as Gutenberg’s printing press in the way knowledge is acquired and disseminated: digital will lead to pedagogical innovations. For example, flipped classrooms become places where students can confront complexity, thanks to privileged exchanges with Professors, while multimedia content is used outside the classroom (videos, texts, quizzes, simulations, serious games, etc.). In keeping with ESSEC’s ethic values and French roots, our aim is to offer lifelong education and access to cutting-edge knowledge to an extended community. As long as we control digital to serve humankind, digital will serve our purpose and contribute to our global impact. But first, we will have to (re)invent education in the digital era!